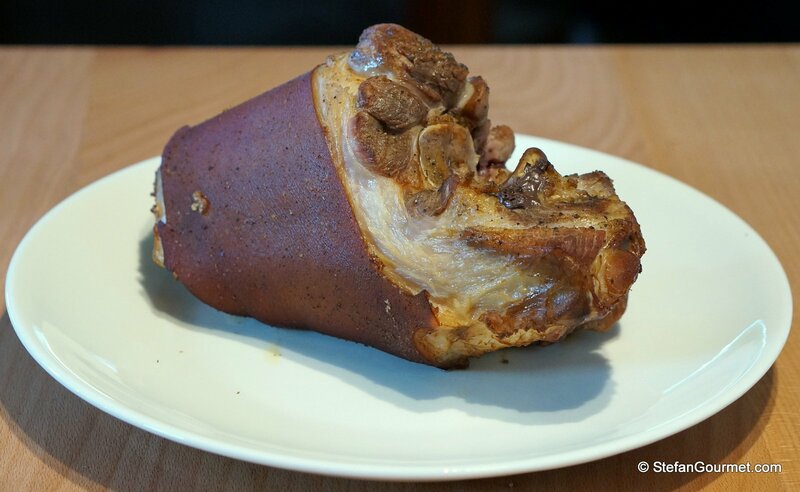 Ham hocks (pork shanks) are an inexpensive cut of meat. They can be turned into something delicious by first hot smoking them and then cooking them sous-vide. This is a technique I’ve used before on ham of lamb and brisket, and I wanted to try it on a ham hock. It was absolutely delicious. A light smoky flavor, tender and juicy. Many recipes call for brining the ham hock first, but there does not seem to be a reason to do this for this preparation. The sous-vide cooking allows the smoky flavors to penetrate all the way to the core of the meat and will turn the meat completely tender without drying it out. 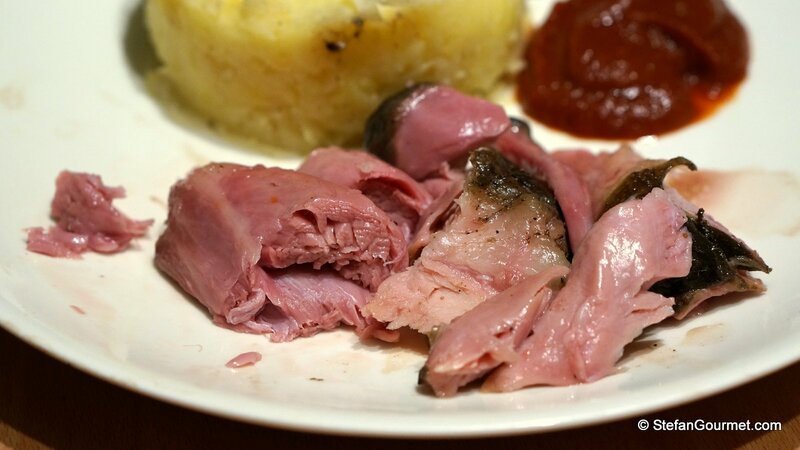 In Germany ham hocks are called Eisbein and are served with sauerkraut (Sauerkraut mit Eisbein). 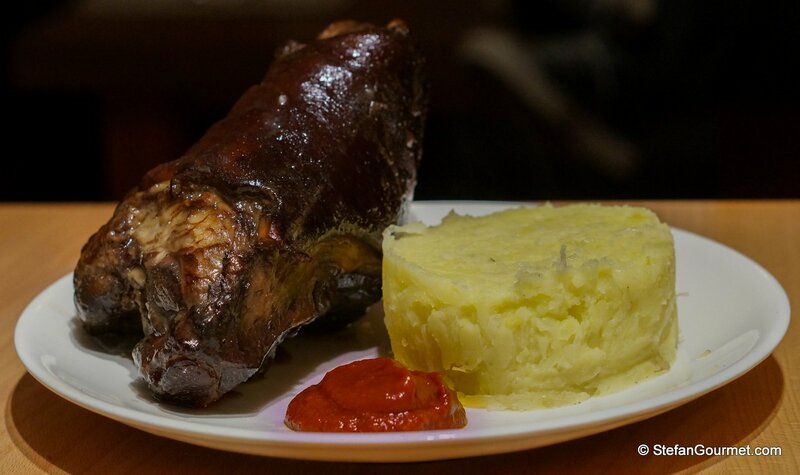 I served my smoked ham hock with a sauerkraut and potato mash, and some homemade spicy ketchup. I had picked up some mesquite wood chips to try them for hot smoking instead of my usual beech sawdust. I did not notice any difference (except for the price tag), so perhaps I should do a side-by-side some time to make sure. Season the ham hock with salt and freshly ground black pepper. 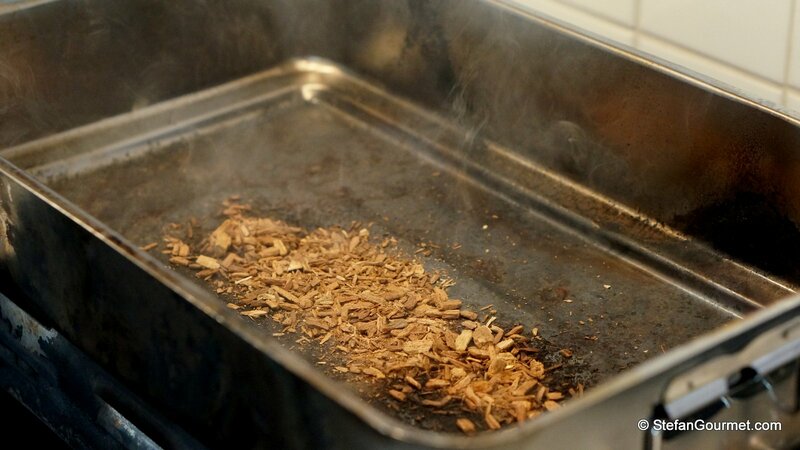 Put the smoking chips in a stovetop smoker and heat up until smoke starts to appear. 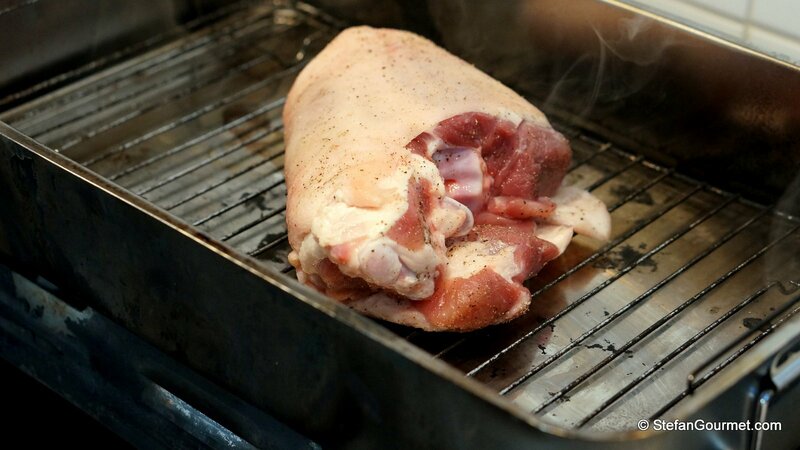 Cover the smoking dust with a dripping tray and arrange the ham hock on a rack. Close the stovetop smoker and smoke for 15 minutes. 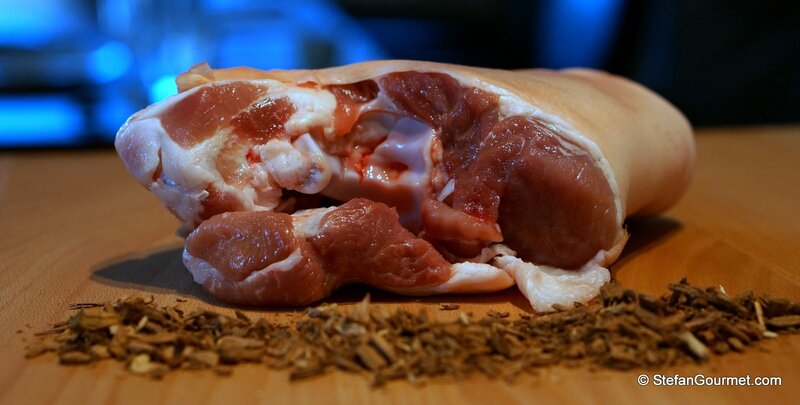 The ham hock will already look and smell great, but it will still be completely raw inside. Cook sous-vide for 72 hours (!) at 57ºC/135ºF. 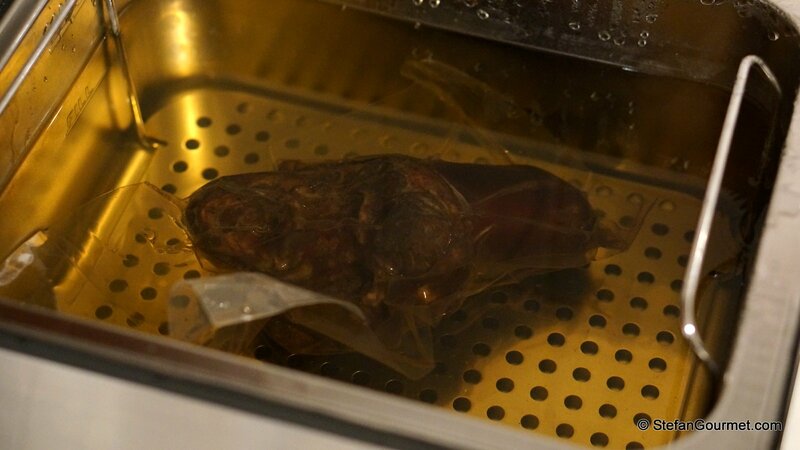 An interesting phenomenon is that although the pouches used for sous-vide cooking are airtight and waterproof, some of the smoke can somehow ‘leak’ through into the sous-vide cooker. This is not a problem, as long as you do not cook something else alongside it (I tried and rather than a nice smoky flavor it will impart a bitter taste — apparently if the smoke can escape from the pouch with the smoked meat, it can also enter another pouch) and if you discard the smoky water afterwards. Serve with mashed potatoes and sauerkraut as well as some ketchup, preferably spicy and of course homemade. Some of my photos from two years ago make me cringe, and this is one of them. 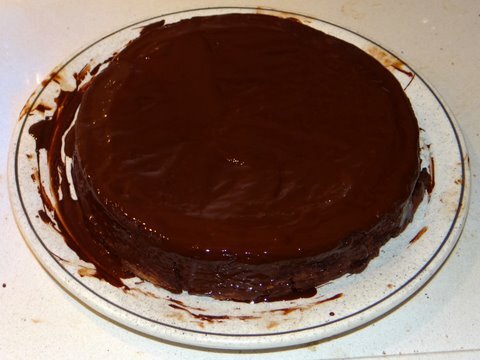 I can guarantee you though that the flavor of this flourless chocolate cake won’t make you cringe! The ingredients? Chocolate, butter, eggs, and sugar. That’s right, it’s not just called flourless but it actually is. I have always just used ham hocks to season meat, I never knew that you could actually make a meal out of them. Thanks for sharing. There is quite a lot of bone and rind, but also a lot of nice succulent meat. Lovely almost caramelized look to the hock! Thanks, John. We didn’t actually eat the smoked rind, but perhaps we should have. This is a real winter warmer. Lovely smoking. That gives me an idea…. Great recipe! Thanks for sharing. The “leaking” of the vaccum pouches works the other way round, too. Some days ago, I cooked potatoes sous vide. I used a large and heavy Le Creuset pot for this purpose, since I needed my sous vide machine for a piece of lamb. I often use the Le Creuset pot for smoking. Even after days you can still smell the lovely flavor. To my surprise, the smoky flavor leaked through the vaccum bag and into the potatoes. Not exactly what I wanted, but funny anyhow. Hi Mike, thanks for your message. I’ve had a similar experience and even ruined a dish that way as the smoke from one pouch leaked out of it into the sous-vide water and then into another pouch that was not supposed to be smoked. It actually turned out bitter. Just came across this recipe today, and it sounds great. I was wondering if you ever tried to glaze and crisp the hock after the sous vide? I think glaze with a little soy and something sweet could be good? I think my family would like the meat a little more cooked, so I am thinking of 60-62C, but maybe it would then be OK to sous vide for 48 hours only? Hi Leif, I haven’t tried glazing and crisping it yet. 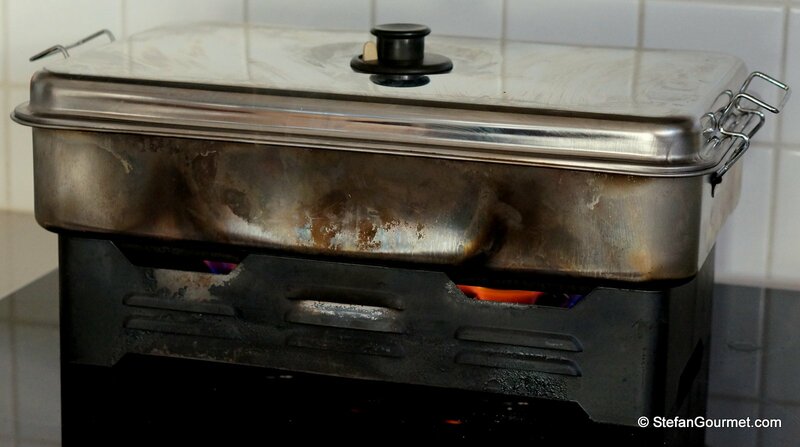 The combination of crisping (which would require high heat) and sugar may easily lead to burning. According to me it would be a shame to cook it hotter 😉 48 hours would certainly be enough if you cook it as high as 60 or 62. You could also go a lot higher and get more of a traditional/stewed texture. Thank you for replying, I will try cooking at 60 and maybe crisp the rind separately. My attempt at crisping this was a failure. 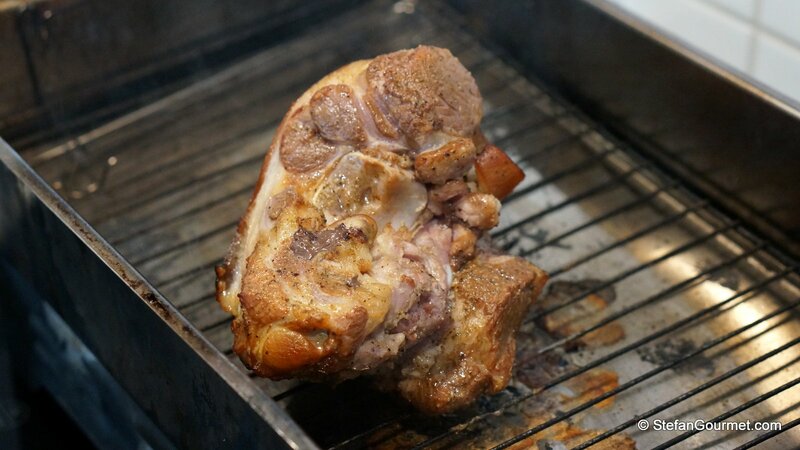 After I cooled the hock, I refrigerated it for a day, then rubbed the skin with salt and a bit of baking soda to dry it out further and encourage the Maillard reaction. I dried it in the refrigerator for two more days (I have one with no wet items in it). I think the sous vide cooking makes the skin too soft (and maybe too moist). Within minutes in the hot oven it dramatically split open! I turned it over and the other side did not crisp at all after 10 minutes. It was delicious anyway! It was like a very tender, moist smoked ham. I am making this again. 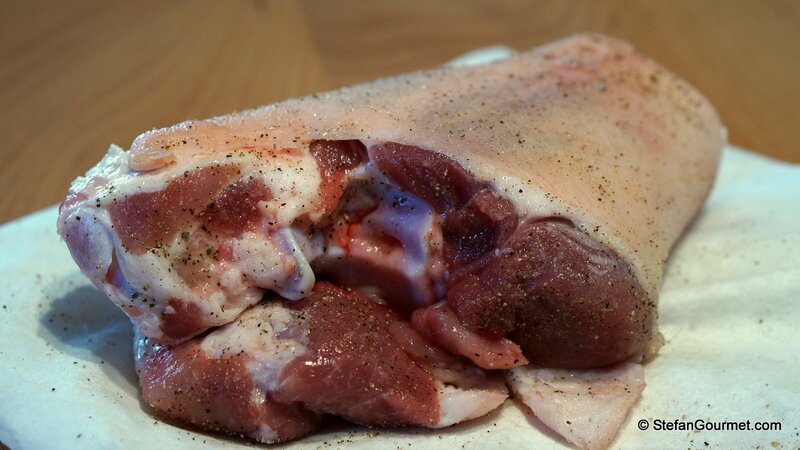 The low and slow sous-vide cooking will dissolve most of the connective tissue in the skin, so I’m not surprised that it would disintegrate or break. You could cook it separately like Leif mentioned. Good to hear it turned out delicious. Tender, moist, smoked ham is what I remember this to be like. I should make this again soon! Yes, I think that removing the rind could work. I’d scrape the excess fat off of the underside and let it dry out at about 300F and then crisp it up at 425. I have two more cooking now, one Chinese style with five spice powder and soy and one with just salt and better. I will try crisping the latter. I do love my crispy pork skin! I want to make Bavarian style schwienhaxe, does this recipe exemplify that? To make Schweinhaxe you’d have to add cumin and aromatics to the sous-vide bag, and after sous-vide crisp up the skin in a hot oven.